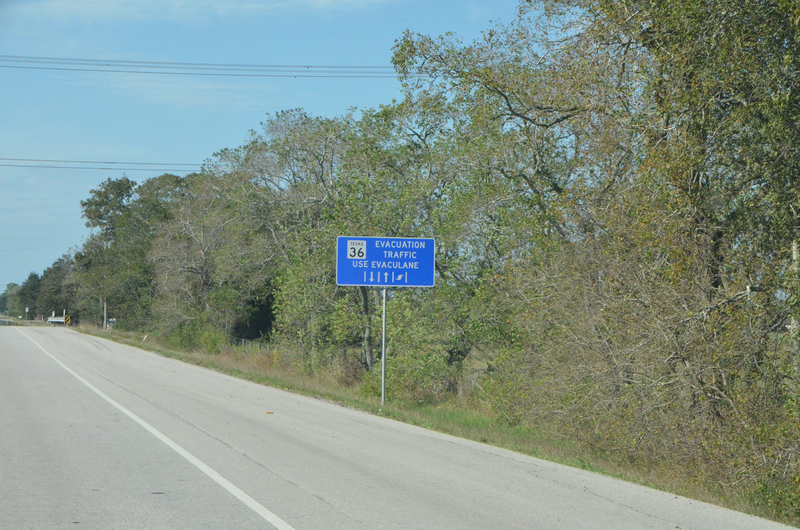 November 16th, 2015 – Texas – Westward through Texas I chose a few back roads rather than doing it all on the Interstate. 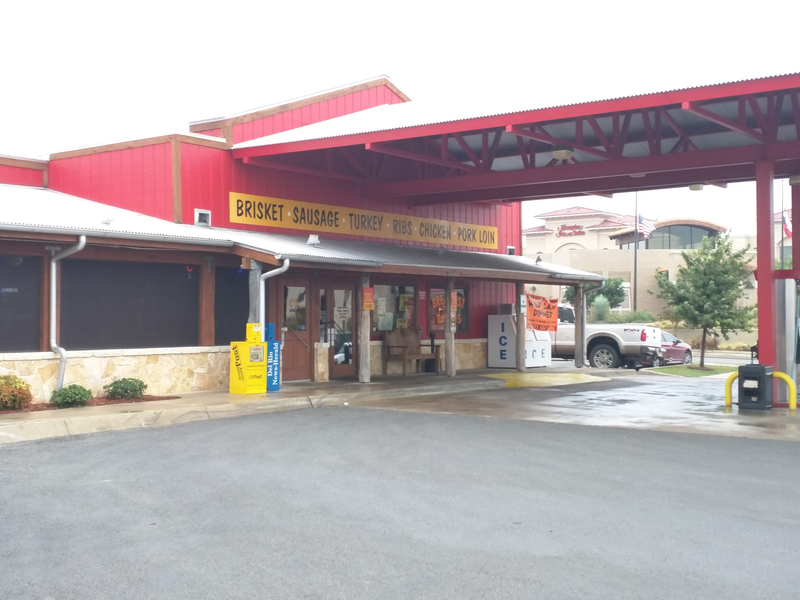 Some highlights included: Hurricane lanes, flood gauges, an engaging information display at a rest area and Bar-B-Q at Rudy’s in Del Rio. On the one hand I’m pushing hard to get west to see canyons, arches, cactus and the like, on the other hand I don’t just want to drive on the Interstate. Back to Interstate 10 from the coast I kept going west on US 90 at San Antonio. East to Del Rio, and Comstock, then North on some back roads to Ozona where I joined up with Interstate 10 again, spent a night in Fort Stockton, then on to El Paso and North into New Mexico. 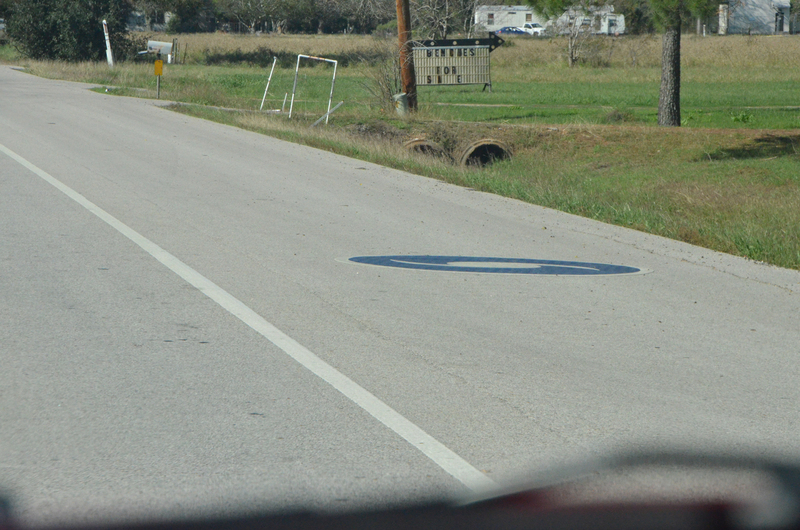 On my way from the coast to Interstate 10 I started seeing an unfamiliar marking on the right shoulder. 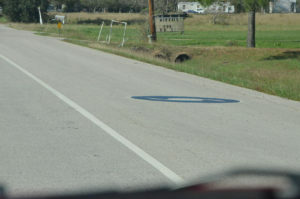 I slowed to look and saw that it was a blue circle with a sort of a swirl in it. It didn’t take long to spot a sign that explained. It is an “Evaculane”. 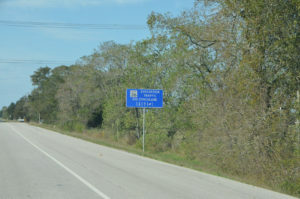 They shoulder had been improved to serve as an extra lane of traffic heading away from the coast, a way to increase outbound traffic without taking up the inbound lane. I counted myself lucky that I wasn’t learning about it’s use out of necessity. Back on Interstate 10, I stopped at the Colorado County Rest area, at about milepost 692. Here I found an unusual visitor information display. 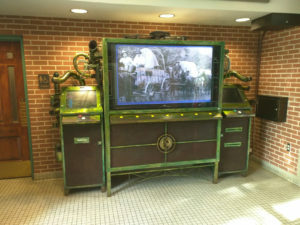 The display had been built up of lots of industrial parts and finished with an antique glaze. It had a whimsical feel, reminding me of some art from a video game, and almost a steam punk feel. You never know what you’ll find at a rest area, and this was one of the nicer surprises. By the time I arrived in Del Rio I was ready for some food. I cruised through town on the main street and nothing really jumped out at me. After leaving town I turned around and headed back for another pass. That’s when I saw the billboard for Rudy’s Bar-B-Q. It claimed to be right next to the Wal-mart, and that sounded like something I should be able to locate. So I headed that direction. 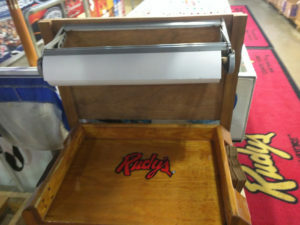 Well, the Wal-mart wasn’t exactly obvious from the main road, but I found it, and the Rudy’s was in fact next door, but on the last side I checked. Happily there was ample parking for the trailer. Inside I was greeted by an employee who was happy to explain how things worked, and good thing too. 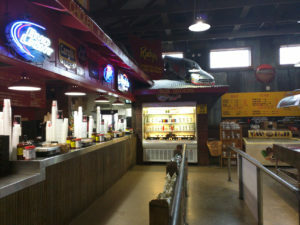 The meat is sold by the pound and sides are sold separately. The single line feeds many potential ordering stations. It was pretty quiet and the employee walked me up and got me a couple of samples. 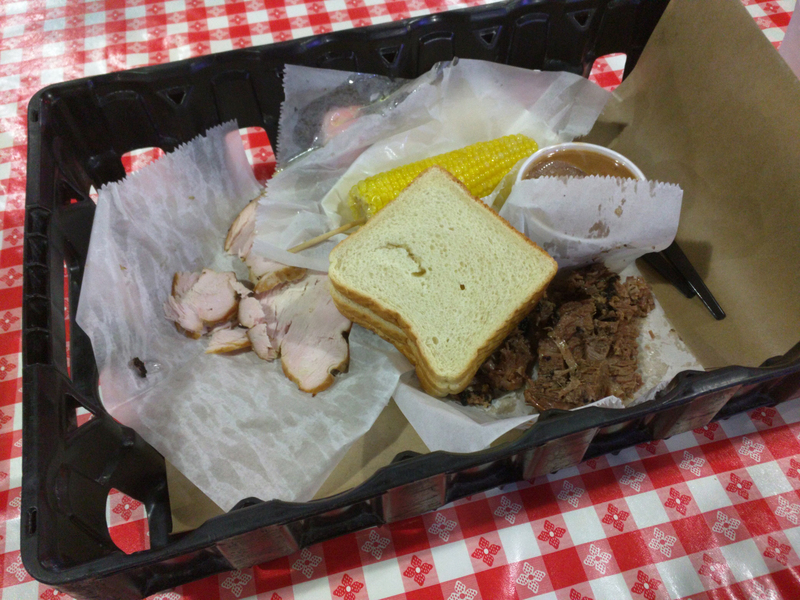 I ended up choosing to order some brisket and turkey, corn and beans. Just when I thought I had the hang of things the host threw me a curve ball. She had turned around an grabbed a loaf of white bread that was open and sitting on the counter. She turned back and with a hand in the bag asked “would you like bread with that?” I had been trying to follow along with the cost of things as it went, but I didn’t know how “bread” would calculate in. She saw my pause but wasn’t quite parsing what I was thinking so she just sort of shrugged like “its an easy question”. So I just threw caution to the wind and said meekly “Yes?”. She smiled, continued pulling bread out of the bag and put it atop the rest of my order. Now that’s another point. The meat is weighed out and served simply on a bit of waxed paper. This and all the rest of the order are served in a “tray” that is actually a case pack for two liter bottles. On to the condiment bar and the table then. Lots of helps for packing your food to go. 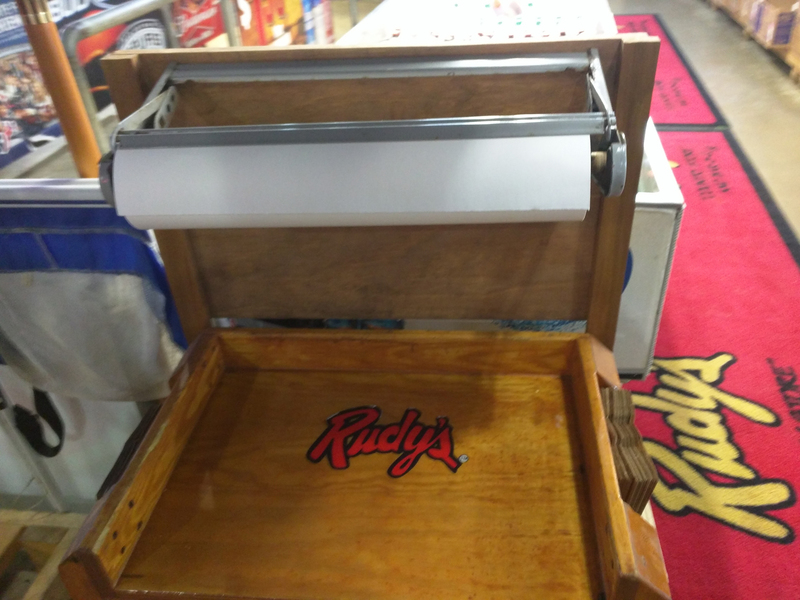 From a dedicated butcher paper dispensing table, every kind of condiment and utensil, including of course the Bar-B-Q sauce. If your experience with Bar-B-Q is some chicken at a picnic that has a sweet sauce baked on, then you’ll find this type of Bar-B-Q a bit different. The meats are slow cooked, but no sauce is applied. 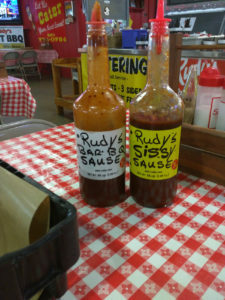 The sauce is provided for you at the table, to apply lightly or liberally, and so that you can choose a flavor that suits. 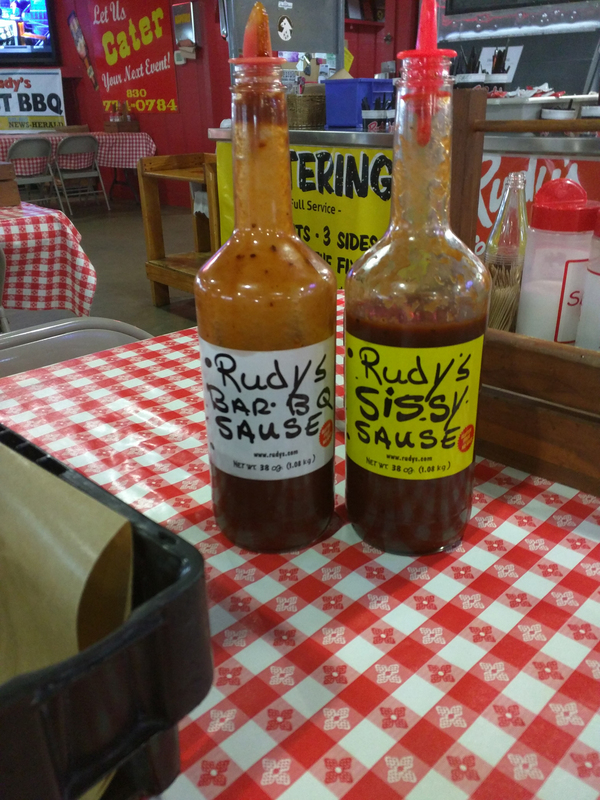 At Rudy’s there are two “Rudy’s Bar-BQ Sause”, and “Rudy’s Sissy Sause” (their intentional spelling). The later having less spicy peppers. I found both to be quite tasty. Back on the road, I had specifically chosen a bit of a side trip for my next leg. Just west a bit from Del Rio, I turned north at Comstock. The two lane road was a fair surface with a few exceptions, and it was a nice change of pace with less traffic. The interesting feature worth mentioning here were the flood gauges in most of the low points along the road. Some of the low points were clearly dips in the road where you could see the obvious course where water would flow crossing the road. Other places where much less obvious to the casual observer. It seemed clear that when the rains come to these mountains that drivers should be on their toes. Back out on the interstate, the wind had finally come full circle. I had a tail wind as I was leaving Florida, and through almost to Texas, then the wind has shifted to be from the south off the Gulf, now it was in my face as I headed west. Heavy enough to keep my driving with the truck traffic, and eating my fuel as I pushed through it. I pulled off to fuel up east of Fort Stockton, and as I stopped the car it was hard to tell I wasn’t still moving. Pebbles continued to be picked up and ping off the car. Happily I had parked heading into the wind, else I would never have been able to close my car door. As it was I timed my exit and entry with the gusts. Colorado County Safety Rest Stop – Visitor Information display – very interesting artwork. My food, note the “tray” is a case pack for two liter bottles. Stephen F. Austin Statue, at Visitor’s Center. 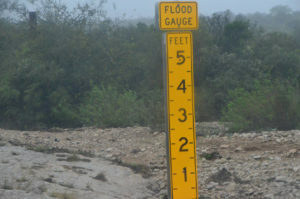 Lots of flood gauges along this two lane road. Some of these locations seem like obvious places where water would cross. This one maybe not so obvious. Back on the wide interstate.